but there is so much more my heart remembers. I try to remember it the way it was. how my faith grew from childhood. When I was little, it was my Mom who I spent the most time with and though I often remember her being bone weary gave me the impression that I was worthwhile. Her hands were always busy with cooking and mending and she though she didn't have much time to read, she read the one book that she loved most. She had her Bible and she listened to her favourite radio Bible programs each weekday morning that encouraged her. In the best of times and the worst of times her faith in God remained and I saw it lived out from my childhood to my own years of mothering young children. I value that she protected me by having boundaries for me before I had sense to have my own. She loved my Dad ... well. She always kissed me goodnight. I reflect on my memories of my Mom today because though she has gone to be with Jesus 19 years ago... today would have been her birthday. ...let your adorning be the hidden person of the heart with the imperishable beauty of a gentle and quiet spirit, which in God's sight is very precious. How precious. I keep memories like that in my heart of my mother and grandmother. That foot stool is very difficult to make by the way. I had a gentle tug in my heart when I saw it because I made one with my mom. I have often wondered how that footstool was made. It lasted for so many years too! Blessings on your memories. Yes!! the precious memories and O so fitting, mostly because of the moral values our Moms taught us by word and example. Then also fitting for me, because 1 year ago in Nov my Mum passed away and her birthday would have been yesterday the 8th of Feb. Thank You for sharing with us...Lis. Happy Birthday to your sweet mom too! Hugs from one daughter to another. Thank you for a beautiful memory, especially from my past. Wonderful tribute to your mom, Happy Birthday in Heaven!!! Yes the memories . my mother passed away at the age of 64 in 1965 .. not even a year after I got married .. the picture now brought back 1964 ,, our wedding year ,, I now see myself .in those .. and where "we" began trtly brings back our 1 st home 50 years ago .. I so believe our parents and us though stuggles along the way ,, lived a much heathier life mentally spitiualy. You could have been describing my home. I laughed aloud at the poinsettia being past the sell-by date. Sweet, precious memories, Lovella. The circle won't be broken. Oh my, the footstool is just like the ones my Grandmother, Agatha Wiebe made. Such a nostalgic photo. Sharon Andres, Gig Harbor, Wa. What a wonderful tribute to your mom. I love the memories that one photo can evoke! You look like your mother, Lovella. Oh yes, plastic drapes/curtains. How I remember! This post reminds me of what a big influence a mom has had and continues to have throughout our lives. Aww - what a sweet tribute to your mom on this her birthday! I too was so blessed to have a mother who nurtured me and taught me so many things (most importantly to live a Christian life). Such a beautiful verse from I Peter - "a gentle and quiet spirit". I need to strive to be like that more. 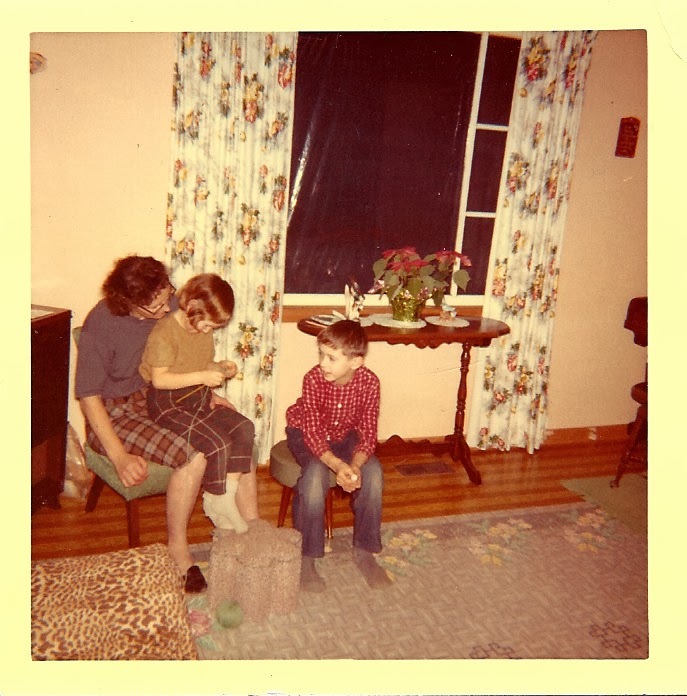 We had the very same tin can footstool in our home - like you said, they lasted forever! Hugs to you today Lovella! I'm here a day late. I knew your mom to be that gentle woman who loved Jesus. She gave you the best of gifts from her heart and hands and life. I love the photo.....a moment in time...a lifetime memory. May we also have that gentle and quiet spirit. I just read this, a week late. Thank you for this...my own dear mom has been gone for almost 6 years, but I have many of the same memories of her. She died from cancer, yet never missed church up until the week before she passed away. Her faith sustained her through good times and bad. God bless all of us who were fortunate to have moms like ours, and God bless all those who weren't fortunate to have one... I thank God daily that I had a wonderful mom.